Collect your Race Bib at the clubhouse on Thursday 10th Jan from 4-6pm or Friday morning at the t-shirt collection tent from 7am. 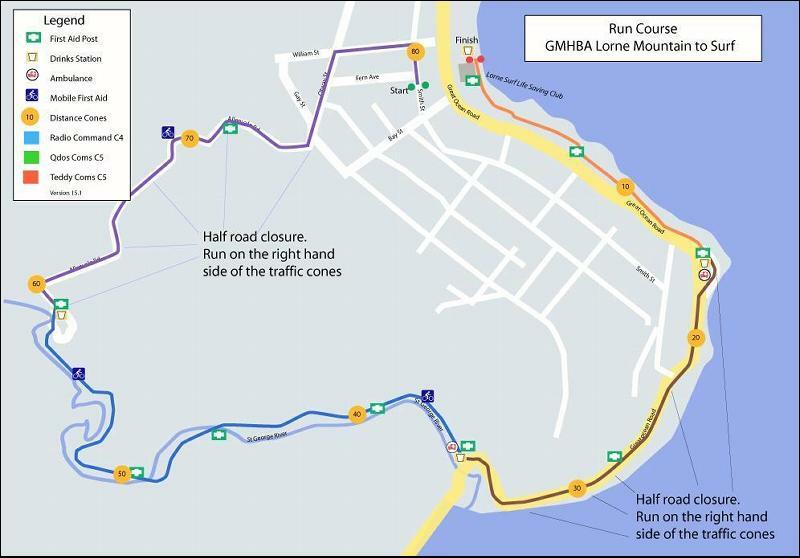 The GMHBA Lorne Mountain to Surf is in its 36th year. 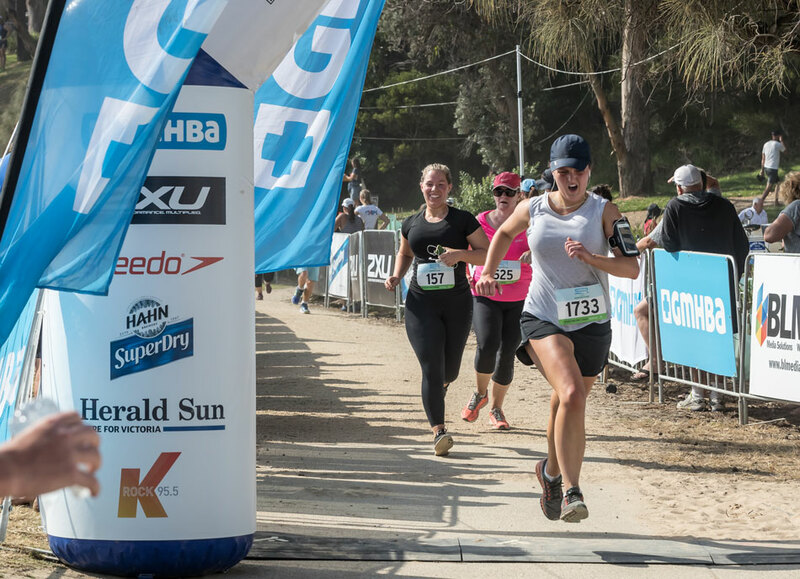 The run is an 8km fun run starting in Lorne and continuing through the forest and then along the Great Ocean Road and finishing at the Lorne Surf Life Saving Club. The next GMHBA Mountain to Surf will be held on Friday, January 10, 2020 starting at 8:30am. This is a fantastic event which caters for all the family as well as the more serious runners and is open to entrants of all ages. Starting in William Street the course winds into the hills behind Lorne and then through the forest along the river’s edge before returning to Lorne along the Great Ocean Rd. The race route is hilly but can be comfortably jogged in about 40-50 minutes by a fit jogger. A fit runner can expect to complete the race in approximately 30-40 minutes. Entries open early November 2019. Some race bibs are mailed out before Xmas. All bibs not mailed or not received can be collected at the clubhouse on Thursday 9th Jan from 4-6pm or Friday morning at the t-shirt collection tent from 7am. Be at the start in William St at least 15 minutes prior to the 8:30am start. The start is a pulse start 200 runners at a time. Last start is at 8:50 am. The run starts in William St. To get to the start go up Bay St and turn right into William Street. The run is started in pulses, the first pulse of 200 runners starts at 8:30am. The first wave is the seeded runners only. Then 200 further runners every two minutes. The first drink station is at the Allenvale carpark, there are drink stations, at the mouth of the George River (on the Great Ocean Road) and at the Pier and again at the finish. We advise all runners to grab a drink as hydration is important for you safety and comfort. When you head off the road and into the forest allow other runners to pass you, the track is narrow in places. When exiting the track at the Great Ocean Road, you may need to stop for your safety. You MUST obey the race officials when crossing the Great Ocean Road as traffic is flowing one way. Once you leave the road at the Pier the course is along the track and finishes in front of the surf club. Your race time is based on when you actually start by crossing the start timing mat and when you cross the finish mat. Start near the corner of Smith and William Street, Lorne. Run down Smith Street towards Grove Road. Turn Left at the first corner and left again at the next corner. Join the river track – be patient – pass only if you tell the runners in front – enjoy the scenery and be aware that there is no vehicle access along the river! Keep to the right of the road, and to the right of the witches hats – runners who go to the left of the hats will be disqualified – this is for your own safety as the road is not closed to traffic. Drinks available at the pier – go down into the pier car park and join the cliff walk. The presentation will be at 9.30am. Results will posted on the surf club wall shortly after. Enjoy the race, and do not hesitate to ask for assistance from marshals. If the run has to be cancelled due to due to safety concerns (e.g. fire, heat) the event will not be re-run. There will not be any refunds; however competitors will be given a discount for the following year.